The App Permissions policy allows you to select any app from the iOS App Store and “remove” it from all of your supervised iOS devices that are running 9.3 or higher as well as tvOS 11 devices (in addition, the feature supports the removal of some built-in apps.) The command does not uninstall the app, instead, it hides it from view so that it cannot be opened. 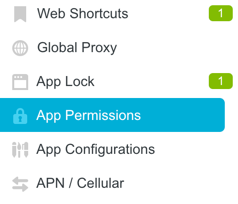 This feature gives you complete control over the apps your users can access! Want to force your users to only use Chrome? You can hide the default Safari browser! 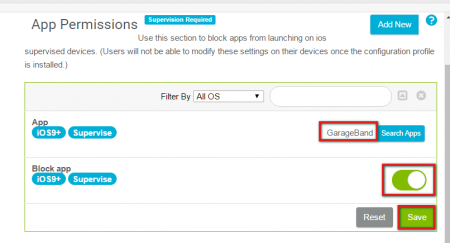 Have a list of apps that you want blocked, such as Snapchat, Facebook, and other popular apps? Block them all! You can access the feature by navigating to Mobile Manager and clicking on App Permissions. The following screen will appear. Click Add New to add a new App Permission. The following screen will appear. Click Search App to search for an app to block. The following screen will appear. Search for any app in the search box. 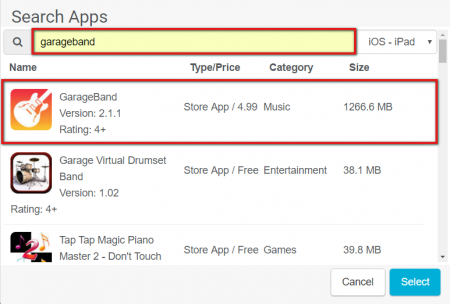 In our example, we searched for Garageband. Click the app you wish to block from the results list. You will now see the App displayed to the left of the Search Apps button. In order to block the app, simply toggle the Block App button by clicking it. Click Save. Repeat this process for every app you wish to block.